Bonbon Beach is just a short tricycle ride from town...P10 and I've heard from the people here that it's one of the best beaches on the island. 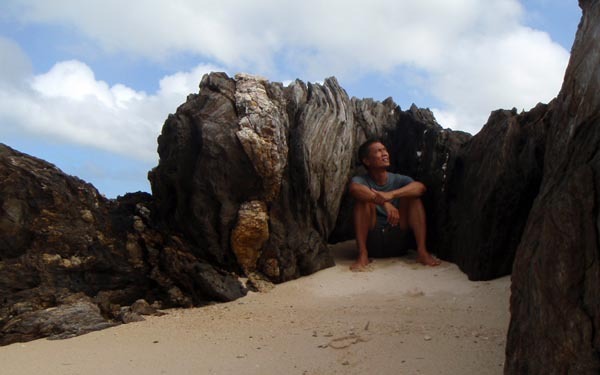 Furthermore, the cool folks at 3P Diving told me that north of the sandbar connecting Romblon Island to Bangug Island is a perfect snorkelling site. With that, I was sold...even if I had to squeeze it in between tight working schedules. True enough, it was maybe 5 minutes by tricycle. But tell the driver before hand where to drop you. Bonbon Beach is a public beach but the access path from the main road is obscure and there is no sign. Once you come out of the foot path, you'll see a few rock formations. Take the left side. At the beach, I began to see the hype about Bonbon Beach. It was empty...all that beach space entirely yours! Cool things came to mind - overnight beach camping for one. I walked its length until I came to the submerged sandbar. This is interesting. 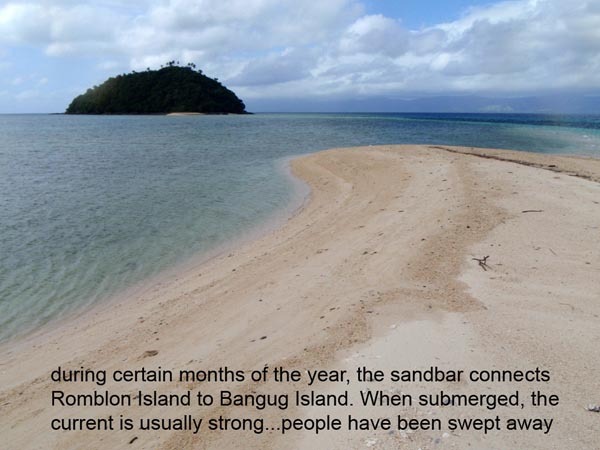 On certain months when water level is low, the sandbar appears above the surface and you can actually walk it to the next island, Bangug Island. However, in this season, the sandbar is submerged. The current is notorious for being strong and people had been swept away by it. Between the sandbar and the rocky area is the reef I was told about. 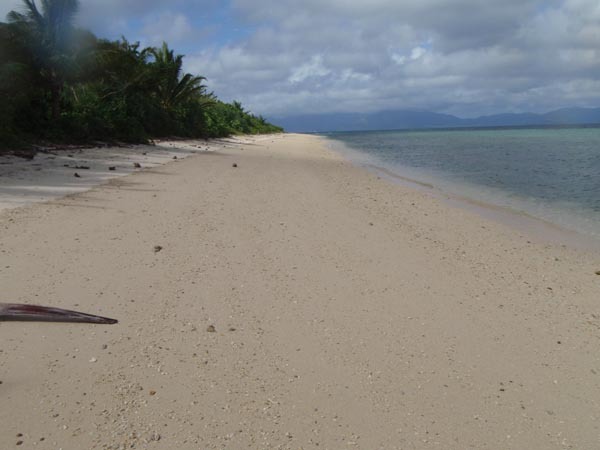 The first 20 meters is covered by sea grass followed by a sandy bottom with coral outcroppings and then the drop-off. I was hoping to find out what lies on the drop-off. Fortunately, I saw 2 fishermen on their boats. If there is a strong current and I get swept away, I can just yell help and they'll come to my rescue - cool! I donned my snorkelling gear and braved the water alone. After the first 2 steps, I realized it was low tide. The water level was only up to my knees! With my shoe-type fins, it means walking the next 20 meters with fins, risking stepping on urchins, star fish, etc. The water wasn't even deep enough to make for a shallow swim. It was useless proceeding. I went back to the beach frustrated and feeling stupid...DUH! Okay, it didn't work for snorkelling, but for everything else, Bonbon Beach is a gem. 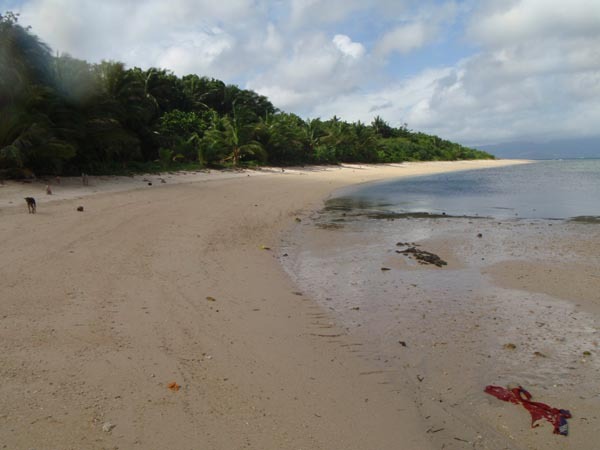 It's empty, it's free, it's wide and long, white sand mixed-in with small stones and shells, it's got access to Bangug Island and lastly, it's a short ride away from town. If you're looking for quick quiet moment away from town but not too far, Bonban Beach is the perfect place. it's a short P10 tricycle ride from town. Just tell the driver to drop you off Bonbon Beach. The access path from the main road is obscure.